Pacific Mall is surrounded by an existing shopping plaza, including the Market Village, and together they encompass over 500 stores and are served by both indoor and outdoor parking areas with over 1,500 parking spaces combined. Pacific Mall is the largest indoor Asian mall in North America. It is located in Markham, Ontario, a city in York Region, where much of the population is of Chinese descent. 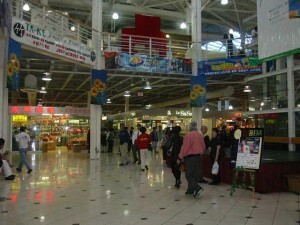 Pacific Mall is a very popular location for Chinese and other Asian shoppers. On statutory holidays, such as Christmas Day, the mall attracts a significant number of non-Asian and/or non-Greater Toronto Area visitors. Pacific Mall incorporates a traditional Pacific-style market. This Asian shopping centre has over 450 mini-shops selling a large variety of retail goods, as well as specialties such as herbs and ginseng, Asian fashions, flowers, accessories, CDs, DVDs, audio hi-fi, cell phones, prescription eyeglasses and sunglasses, furniture, toys and stationery, and entertainment. It is also a well-known place for computer and car enthusiasts alike. There are a variety of places to buy Asian food and drinks in the mall. For more information please call 905 470 8785 or visit the website.